Bjørn Wiinblad’s contemporaries nicknamed him “nature’s cheerful son” for his desire to bring joy with his art, but his fascination with nature was also quite concrete. Few Danish artists have depicted the changing seasons with such true-to-life charm and enchantment as Wiinblad did, and Christmas is of course no exception. 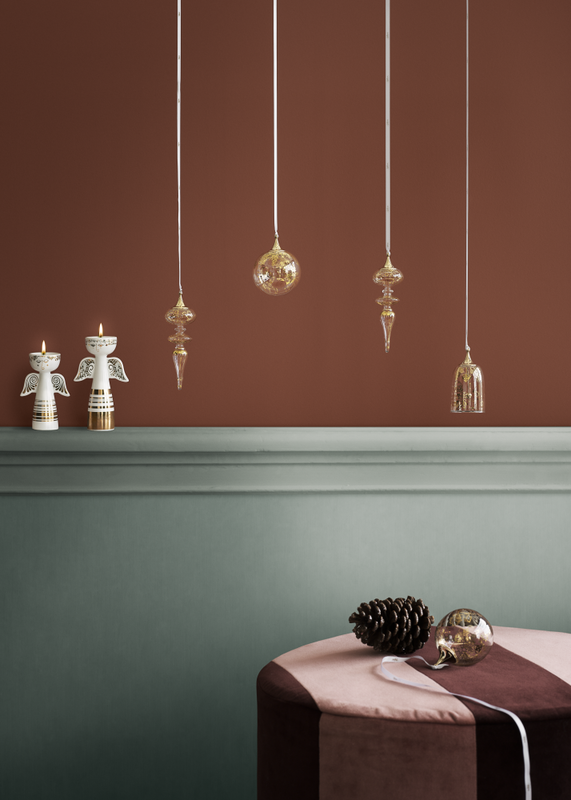 Over the years, Wiinblad was behind a number of Christmas ranges, and Bjørn Wiinblad Denmark is now rediscovering and reinterpreting motifs from these for this year’s new Christmas design: the Advent Candle Holder, Tealights and Glass Ornaments. As a maximalist, Bjørn Wiinblad struggled with the art of limitation, but in the case of the Advent candle holder, the design is a set assignment! 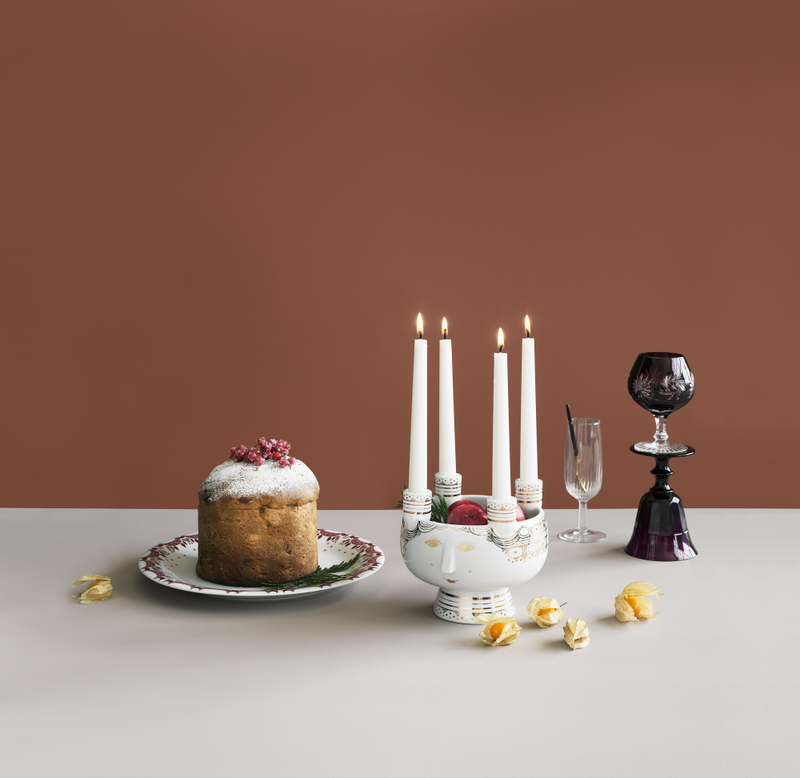 Obviously, there are only four Sundays – and therefore four candles – in Advent, so the scope for developing the theme lies primarily in the embellishment of the candle holder and the styling of the dish in the centre. This is what makes the Lucia Advent Candle Holder stand out, drawing on the best of both worlds with its roots in the Nordic Saint Lucia tradition and Bjørn Wiinblad’s iconic pots with women’s faces. In keeping with contemporary interior design trends, the candle holder is made of chalk-white, glossy porcelain with graphic metallic silver or gold decorations, allowing the styling of the Lucia Candle Holder to steer this year’s Advent in a new direction. Fans of a minimalist Christmas will of course fill the spacious porcelain bowl with nature’s own decorations, such as pigeon apples, cones and soft spruce sprigs, while the modern glamourista will turn up the heat on the styling by adding lots of antique glass beads, coloured sweets in crinkly paper or Advent gifts in trendy wrapping. Bjørn Wiinblad Denmark has also thought of those who simply can’t get enough of the festival of lights in December and who want to add tealights to the cosy Advent ambience, or perhaps create their own, alternative Advent wreath out of a whole host of angels. 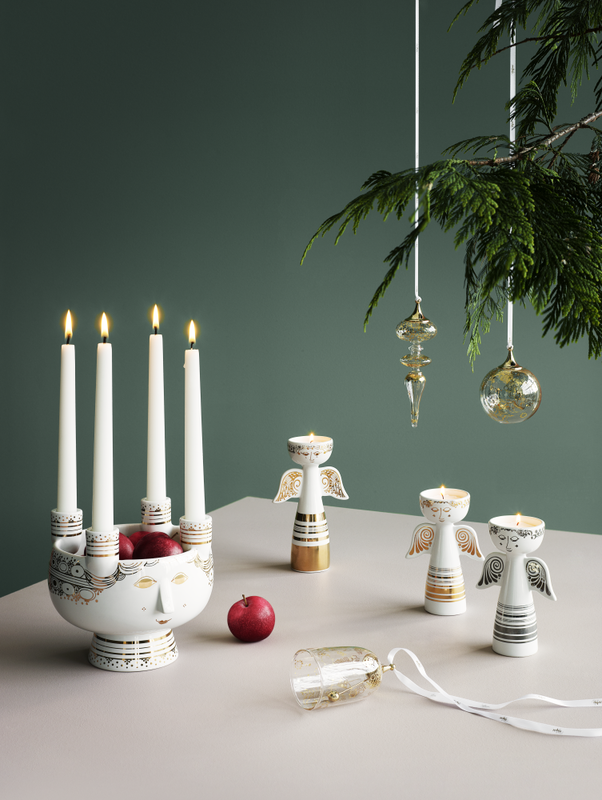 The Tealight Angel is available in two heights, with different motifs. Like the Advent candle holder, the look is naïve, yet decadently decorated with Wiinblad’s distinctive silver and gold stripes, giving the angels graphic lines on their robes and a quirkily pious look in their eyes, while the flame of the tealight burns like an aura. For the tree, windowsills, on gnarled twigs or as part of a creative still life, three crisp glass ornaments are also being launched in classic shapes: the Bauble, Bell and Icicle. The shapes, convoluted gold patterns and motifs derive from the 1001 Nights Christmas tales, with strong references to the generosity and joie de vivre of Wiinblad’s own life, not just at Christmas but all year round.